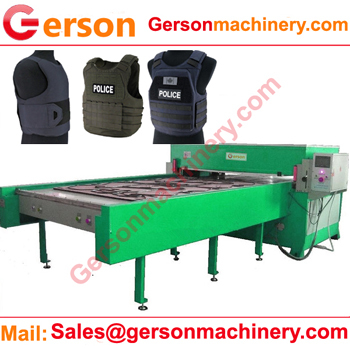 1.This kind of die cutting machine can die cut out any shapes of soft body armor .It can work with the cutitng die and molds which made by Gerson . 2.The press machine is for cutting the material sheet or roll with manual feed material or autoamtic feed material based on your request. 3.All hydrsaulic parts are lubricated with oils supplied by the hydraulic system guarantees machines precision and prolongs service life of the die cutting machine. 4.The Precision four-column die cutting machine of special specification can be customized.welcoem to contact Gerson at any time.